A nippy smallish car to challenge the Ford Focus. It is strange how small things in a car are remembered. With the Kia cee’d GT it is the door locking mechanism. Put the key away in your pocket and forget about it. Get close to the car and the folding mirrors open and the doors unlock. Getting out it is the same in reverse, except you have to touch the actual actuator on the door. Nothing could be easier. Kia describes this version of the strangely named five-seat saloon as a GT, and it is with a 0-60 of just over seven seconds. In theory the top speed is 143mph, rather quick for a family carriage. A six-speed rather clunky manual gearbox coupled to Kia’s 201bhp 1.6-litre T-GDi engine is what gives the game away and however hard you try you will not get much more than 35mpg. The chassis is said to be ‘sports tuned’ and the settings proved ideal for a long weekend on the Isle of Wight, a short ferry ride away from mainland England with mainly narrow roads, rather like Guernsey and Jersey, but with the odd dual carriageway thrown in. It is a (South) Korean car designed and built in Europe with a very high level of interior trim and all the ‘toys’ now expected of the next level up. It feels like a quality car. This new GT version has an electronic sound generator which delivers a distinctive and exciting engine note into the cabin. When activated via a ‘GT’ button on the steering wheel, the traditional analogue speedometer changes to a digital numerical display and shows torque and turbo gauges and engine coolant temperature as well as important trip information. Braking is all-disc brakes, 17in at the front, and the stylish 18in alloy wheels are shod with 225/40ZR18 Michelin Sport tyres. Kia tells us that the front brake discs shortens the 62-0mph stopping distance from 36.4m to 35.2m. They work well! The cee’d comes with a MP3-compatible DAB radio as part of the six-speaker audio system and the USB and AUX ports are illuminated, a nice small touch. A 7in satellite navigation screen with Kia Connected Services features an excellent TomTom navigation system supplying additional driving information including traffic updates, speed camera locations and weather reports. The screen is also linked to a reversing camera. 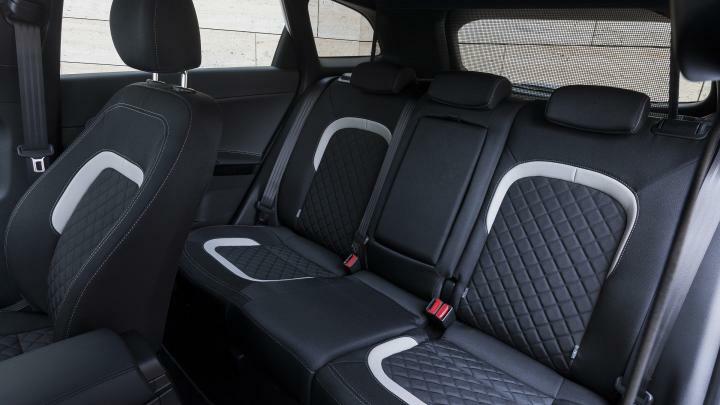 A performance-oriented exterior design is echoed inside the all-black five-seat cabin. The driver and front passenger sports seats are by Recaro suitably labelled. Power-adjustable lumbar support is fitted to both front seats. The upholstery is part leather and part suede, and there is red contrast stitching on the seats, steering wheel, gear shifter and door trims. The driver and front passenger seats are also heated as is the steering wheel. The engine start/stop button is coupled to an automatic de-fog system. The comprehensive safety specification includes Electronic Stability Control (ESC) and Vehicle Stability Management (VSM), Hill-start Assist Control (HAC), anti-lock brakes (ABS) with Electronic Brake-force Distribution (EBD) and Brake Assist (BAS), six airbags with a cut-off switch for the front passenger seat, a seat-belt reminder warning, impact-sensing door unlocking and ISOFIX child-seat mounting points. Soft-to-the-touch surfaces and outstanding fit and finish attest to the emphasis that Kia places on actual as well as perceived quality. This is matched by the GT’s cruising refinement. Torsional body strength is aided by a windscreen which is bonded in, rather than mounted in a seal, so it also shuts out more exterior noise. One-piece weather strips around the door frames, extensive filling in the pillar areas, carefully shaped door mirrors and thick door glass all play a part in the GT’s refinement. There are storage compartments in the front, rear and centre console, while the large boot provides 380 litres of space. Both sections of the 60:40 split rear seats fold down to allow 1,318 litres of luggage space (pro_cee’d GT 1,225 litres). This is supplemented by an under-floor storage area. 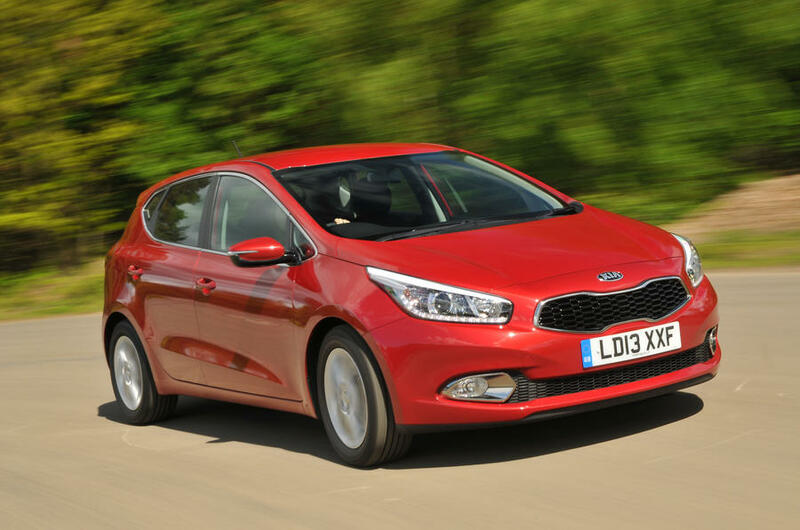 The Kia cee’d GT is best described as a ‘gutsy’ car ideal for rural roads where its performance gives a sense of enjoyment when driving. It is not suitable for the school run. It sells well but the Korean’s and the Slovak assembly plant people need to get together to find a more understandable name for English speaking markets. Perhaps for the next model. The GT models, like every Kia, comes with a seven-year, 100,000-mile transferable warranty.